In this paper, we introduce a framework for regularized least-squares (RLS) type of ranking cost functions and we propose three such cost functions. Further, we propose a kernel-based preference learning algorithm, which we call RankRLS, for minimizing these functions. It is shown that RankRLS has many computational advantages compared to the ranking algorithms that are based on minimizing other types of costs, such as the hinge cost. 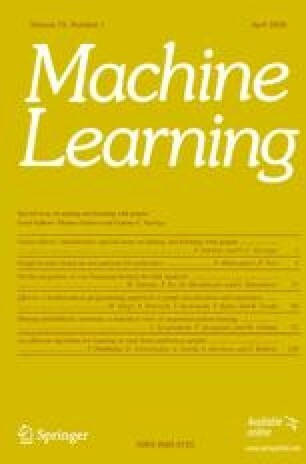 In particular, we present efficient algorithms for training, parameter selection, multiple output learning, cross-validation, and large-scale learning. Circumstances under which these computational benefits make RankRLS preferable to RankSVM are considered. We evaluate RankRLS on four different types of ranking tasks using RankSVM and the standard RLS regression as the baselines. RankRLS outperforms the standard RLS regression and its performance is very similar to that of RankSVM, while RankRLS has several computational benefits over RankSVM. Editors: Thomas Gärtner and Gemma C. Garriga.